The House Health Quality subcommittee voted 10-4 Tuesday to approve House Bill 1335, which would prohibit a physician from performing an abortion on a minor unless the doctor has parental consent. Bill sponsor Rep. Erin Grall, R-Vero Beach. 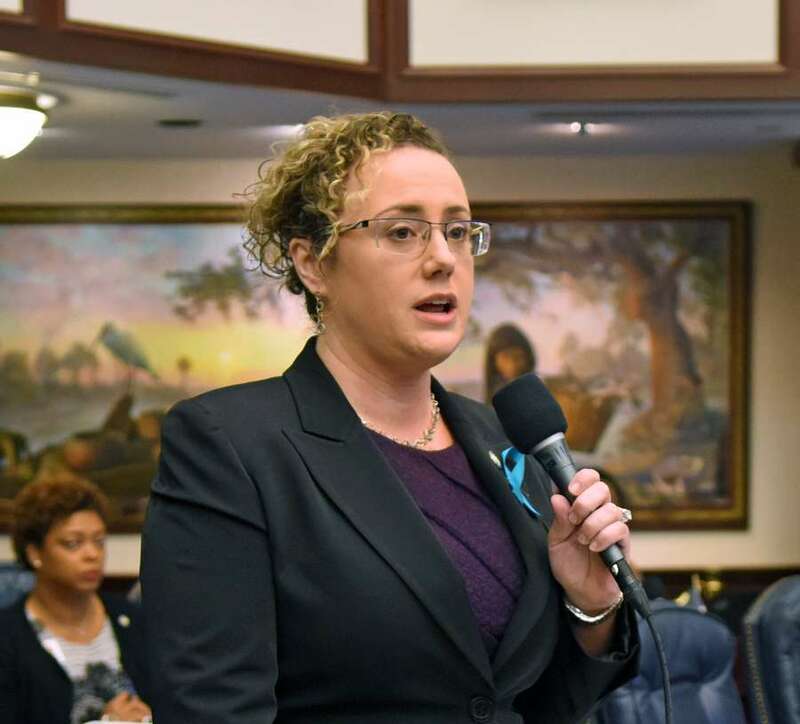 A bill that would require parents or guardians to consent to a minor’s abortion before it is performed is now moving through the Florida House, after lawmakers in a heated hearing voted largely along party lines to advance the bill past its first committee stop. The House Health Quality subcommittee voted 10-4 Tuesday to approve House Bill 1335, which would prohibit a physician from performing an abortion on a minor unless the doctor has parental consent and complies with existing requirements to notify them of the procedure. The bill allows minors to seek a waiver from a court to bypass the consent requirement, if judges find “clear and convincing evidence” a minor is mature enough to decide to obtain an abortion. A waiver could also be granted in cases where evidence indicates minors are likely victims of child abuse or sexual abuse by a parent or guardian or a judge otherwise decides it is in their best interest. “I believe parents have a fundamental right in the upbringing of their children,” said Rep. Erin Grall, R-Vero Beach, who sponsored the bill. She cast the bill as a way to ensure that abortions are done more safely and as a way to support minors who are considering the procedure, even if they seek a judicial waiver to bypass the consent provision. The bill sets standards for legal counsel for minors who go to court for a waiver. It also increases the penalties for not caring for an infant born alive during an abortion procedure, from a first-degree misdemeanor to a third-degree felony. In Florida, if a minor is seeking an abortion, state law requires that a parent or guardian be notified, with exceptions in cases such as medical emergencies. Minors who have obtained a judicial waiver from the notification requirement, are already parents, or have other extenuating circumstances are also exempted. Grall’s bill also applies those exceptions to the parental consent requirement. The issue of parental consent has been long debated and litigated in Florida, as well as on the federal level: A similar law requiring parental consent was struck down by the state Supreme Court in 1989, citing a broad state constitutional right to privacy that the courts have asserted applies to a woman’s pregnancy. A law pertaining to parental notification was also struck down in 2003, though voters the following year approved a constitutional amendment to create a new notification law. She also denied, after a question from Smith, that the bill was deliberately intended to raise a legal challenge to the existing privacy standard before the Florida Supreme Court. Several Republican lawmakers, arguing in support of the bill, compared abortion to other actions — getting a tattoo, even getting permission for an aquarium field trip — that already require parental consent. “I think everyone would agree it’s a weighty decision,” said Rep. Mike Beltran, R-Hillsborough. But Barbara Mayall of Pensacola, 65, wavered between tears and frustration when she told lawmakers spontaneously that she had had an abortion at the age of 25. She had told only a handful of people before Monday, not including her son, who was watching on a livestream. Two activists were also escorted out of the meeting, after each interjected while lawmakers were debating the bill. But Rep. Scott Plakon, R-Longwood, responded by saying he saw little room for agreement when both sides disagreed on a question as fundamental as when life begins. “It’s going to be very difficult to solve this problem,” he said. A similar bill setting requirements for parental consent in the Senate, SB 1774, sponsored by Sen. Kelli Stargel, R-Lakeland. has been referred to committee but has yet to be heard. A linked bill, HB 1397, also sponsored by Grall, would exempt information identifying a minor who is seeking a judicial waiver in such cases from court records. The parental consent bill joins a handful of others in this year’s legislative session that would restrict abortion . Two sets of bills, HB 235/SB 792 and HB 1345/SB 558, would limit the procedure to before a fetal heartbeat is detected or to 20 weeks, respectively. Though all of those bills have been referred to committees, none has yet been scheduled for a hearing. The bill would go into effect July 1.